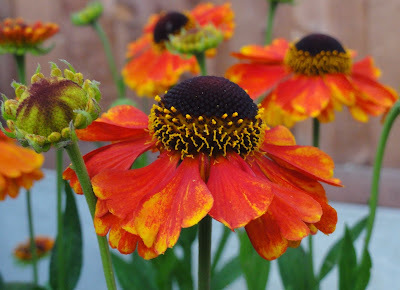 After posting a photo of Helenium 'Sahin's Early Flowerer' for #WordlessWednesday this week, I got to thinking about what a great plant this perennial is, and decided to extol it's virtues. I've been growing this Helenium for a number of years. In fact my current plants are great-grand children of the original plant I purchased about 8-9 years ago, as one of it's many virtues is that it bulks up quickly and is easily divide and replant so you have more plants. It likes full sun, but can grow in an East, West or South facing aspect. I've actually grown mine in both full sun, and part-shade, where it might only get 3 or so hours of direct sun and then several hours of dappled shade. Instructions usually say it likes well-drained soil, however, I've had no problem growing it in heavy clay, I just add compost at the initial planting. It appears to be fully hardy, having survived up to -20 in my garden over the last few winters. The RHS says it should have support for best results, but I've never every used support for this plant, it has always supported itself and provided wonderful results. It needs very little attention apart from deadheading. Do this and it will just keep flowering its socks off. Helenium's are easy to propagate via division (see bulking up below). Once hit by frosts the stems will go black. Cut these back to the base (usually there will be some leaves still showing), add a bit of compost to mulch and leave; they will come up again next year. 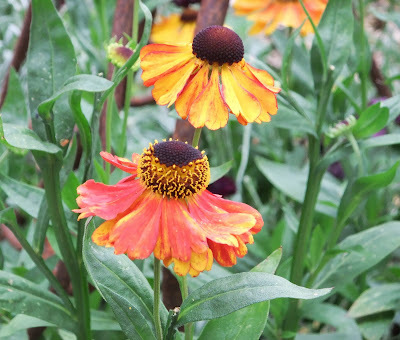 This helenium gets full points for a really long flowering period. In my experience, it usually it flowers from June until first, even second frosts. Most years it has flowered from June to November or early December. In 2011 I noted on my blog that it was still flowering on 28th December. So with a little dead-heading, you get beautiful flowers for months and months and months. Another way to enjoy this plant is as a cut flower. As it has strong long stems with multiple flowers, it stands up well in a vase and will continue to flower for up to 10 days. Taking cuttings also encourages the plant to send up more shoots and flowers, so you can pick it for cut flowers several times over the season. 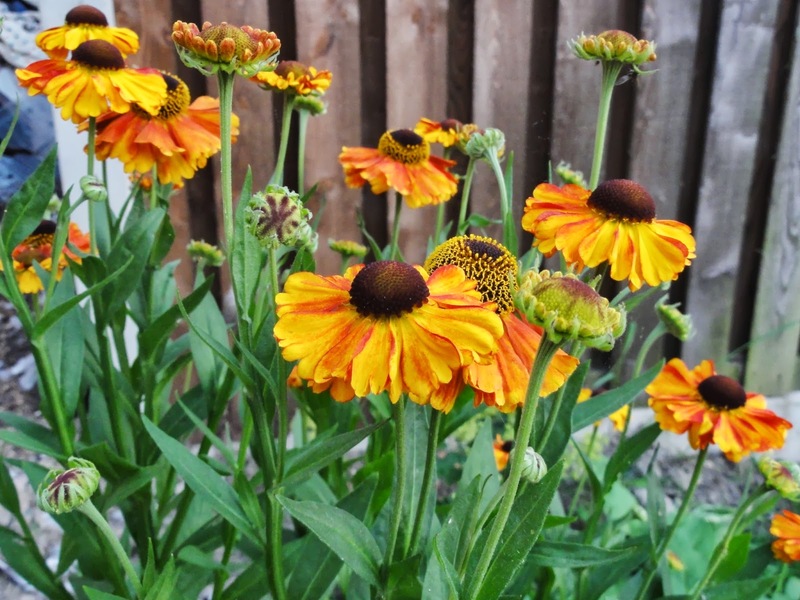 I've given bunches of Helenium Sahin's Early Flowerer to many friends and colleagues over the years and it is always greeted with great pleasure. Friends have reported not just how long it kept flowering once they got it home, but also asked, "how do we get hold of this plant?" Which leads me onto another virtue, its bulking up qualities. 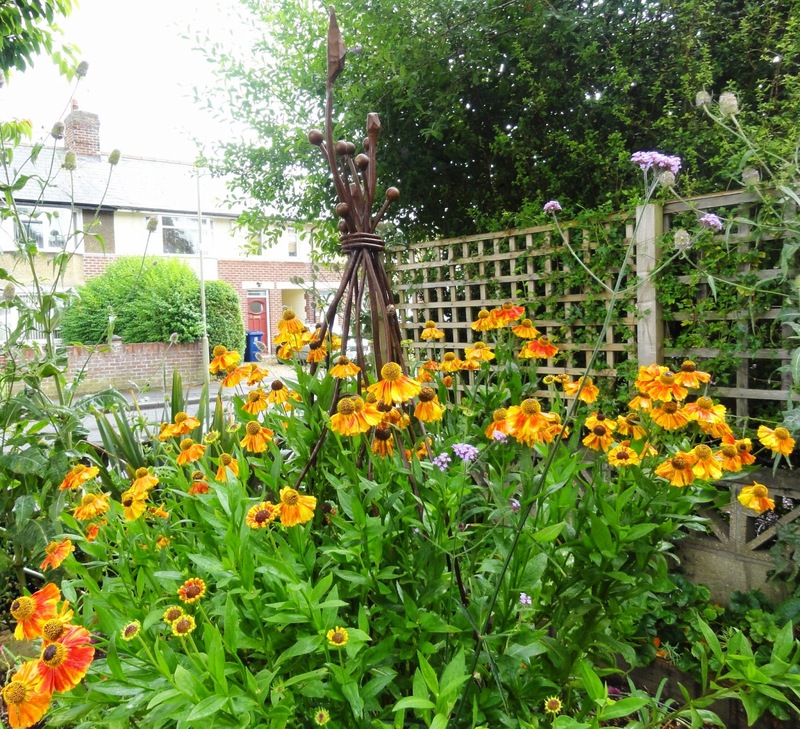 Within a couple of years of having planted the original plant, it had bulked up, that is, increased its roots and the amount of stems it sends up year on year, sometimes doubling each year I have found. It is worth dividing your perennials as this helps promote health and vigour in the plants, and is a great way of getting more plants for free. From here you can pot them up and pass them on to those eager friends, or immediately plant them straight out into your own garden or allotment to enjoy a larger collection that will continue to flower for years. For more information on dividing perennials, see this section on the RHS website, including a great short video (only 48 seconds) that shows you what to do. 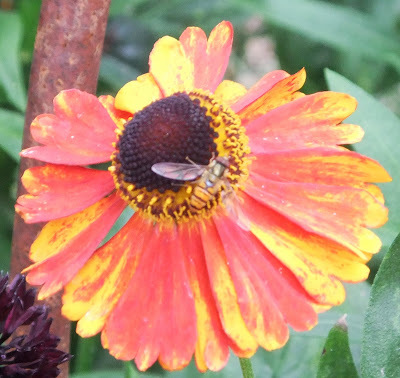 I have found that bees and hoverflies love this plant and are usually buzzing around it when I'm walking past. They wouldn't hang out at a plant that didn't feed them! The only 'negative' of this plant is that it has no fragrance. However, I think all the virtues listed above well and truly make up for this small omission. Its burst of colour, long flowering period and ease of growing and division, make this a plant well worthy of praise. What do you think? Gwenfar, we're one of your recipients as you know. These are crazy flowers. They just do their thing, with the least attention I've known of almost any flowering plant. As per your advice along with the existing deadheading I'm now looking at moving cut flowers into the house more frequently, to see if it gets a bushier habit thanks to doing so. Another post I saw somewhere suggested they should be really quite heavily watered; I'm trying to square this with having them against a south-facing wall all this time. It's a wonderful plant, and still seems pretty healthy, but we've found that the lower leaves are defnitely starting to go brown. this is really useful growing info for this plant, ive been thinking about getting a few to put infront of some grasses. the winter structure is supposed to be good, i wont be cutting them down.